This is Fatima Outaleb with her mother. Although Fatima is from Ben Smim, she does not know how to weave. She went to school for nine years, unusual in the past, so perhaps that took her time instead of weaving. She's married but has no children yet. Her husband works in agriculture sometimes, but has no land of his own. 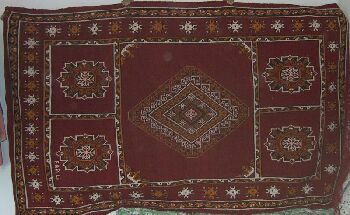 Fatima had the rug below made for her, and now she wants to sell it. She will share the income with her husband, and would like to use it buy an armoire, or free-standing closet, for her home. 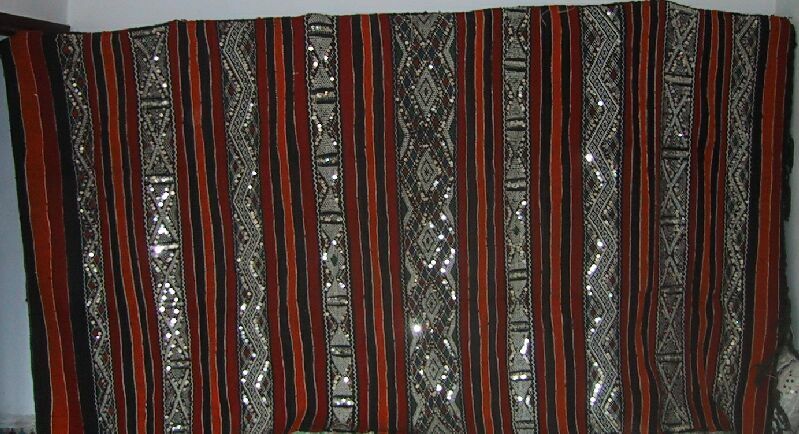 Piece 2.12313 is a detail of a flatweave with orange, orange-red and black plain stripes, plus design stripes in white and black with accents in royal blue, green and orange. The full piece did not show up well in a small size, but you can see it here. This piece measures about 5'5" x 10'8" and costs $280. 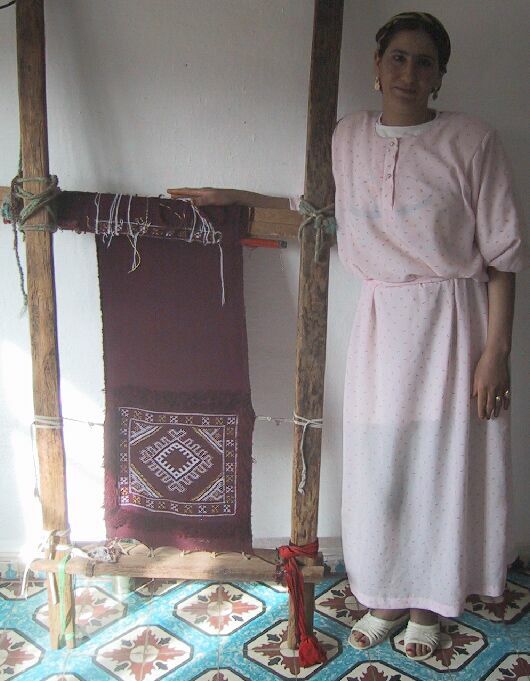 This is Aicha Fadili, and she weaves both flatweave pieces and another style in pile. 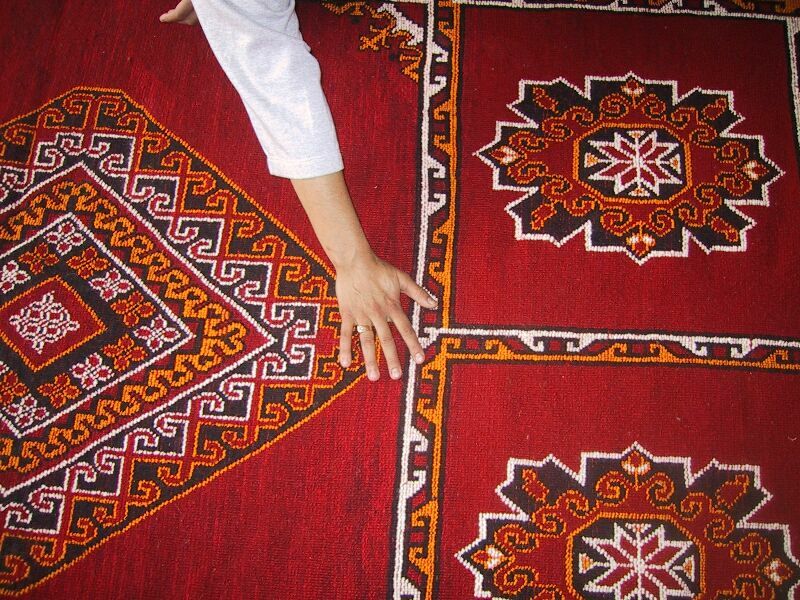 She is kneeling on one of the pile rugs here, and more of it is shown below. 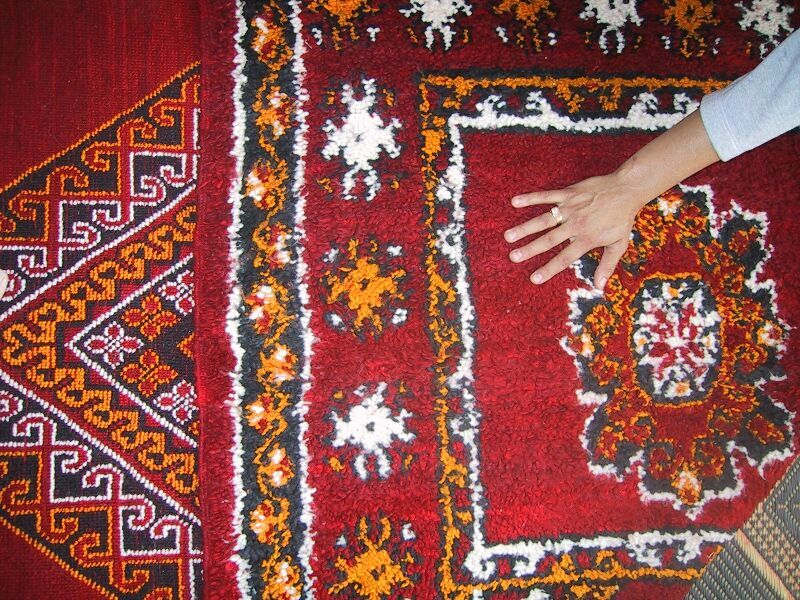 We asked if she could make the same style rug to order in other colors, and she was very reluctant. She was afraid it would not look good, and the buyer would be disappointed. I really appreciated her hesitation: people will often just say "yes" to please you, but this showed me that she's very serious about her craft. You can see that in the quality too. In the background behind her you see another local piece and how it's used - I have some for sale too. It's a bedspread in natural wool with tufts of colored acrylic yarn and lots of sequins. 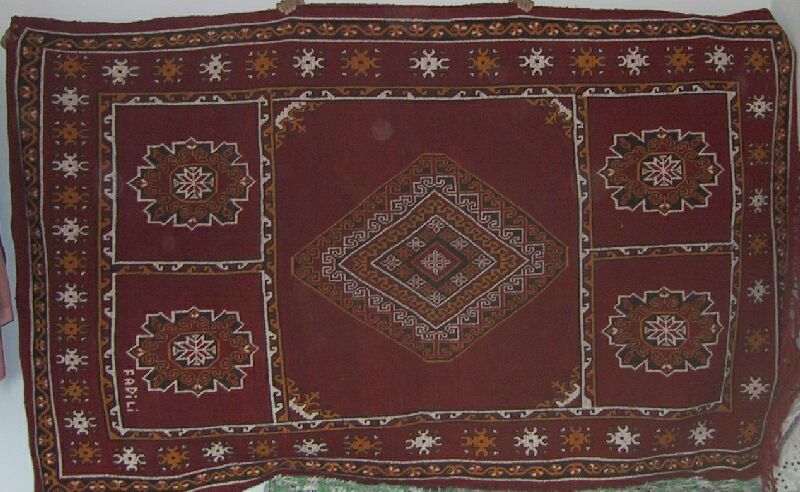 Piece 2.12309 is a rich, deep red pile rug, which in fact can be used on either side. It has accents in black, white and a yellow-gold. 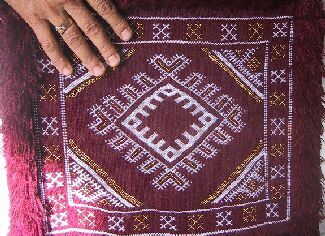 An unusual touch is the weaver's name woven into the lower left corner. 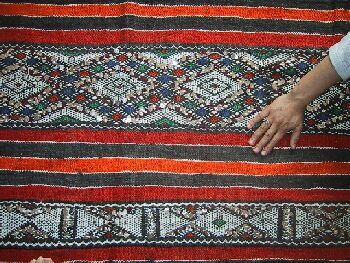 If you click here you can see a close-up of the flatweave side, and here shows you that plus the pile side (with her hand on it) for contrast. This is a large piece measuring about 6' x 9'8" and costs $460. SOLD but she may have a similar one. Aicha also wove the pillow below on this loom. The photo shows you how pillows are made: although they have two faces with different designs (here one face is plain), they are made in one piece. You can see the back of an identical pillow that has been finished and rolled up on the top of the loom. Piece 2.12317 is a pillow in a deep maroon with accents in white and metallic gold thread. 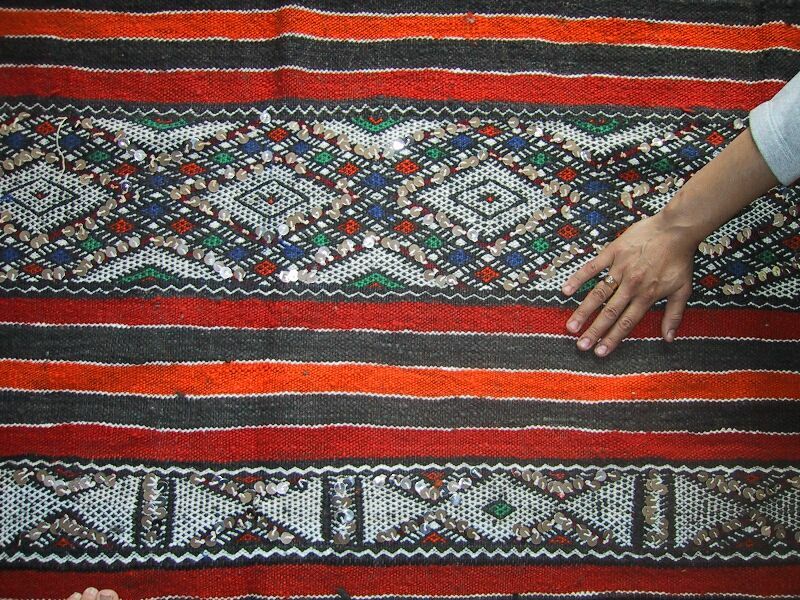 Click on the photo to see the delicacy of the design, which reminds me of Fes embroidery. There are two of these, and Aicha says they are washable. They measure 15" x 16 1/2" and each costs $46. 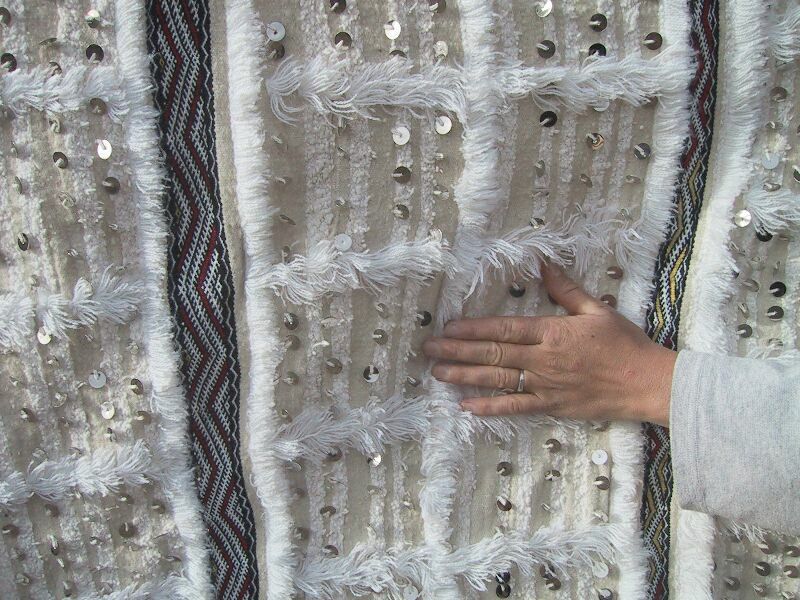 This is Halima Outalb who wove Piece 2.12324 which she's holding. She would use it as a bedspread, but it could also be a wall hanging. 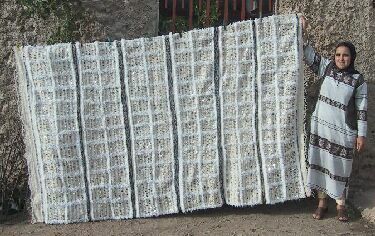 It is made of wool and cotton and has acrylic yarn fringe. There are thin design bands with colored accents and sequins; click here to see them better. The off-white is wool and the bright white cotton. Halima is in her early thirties and married, but has no children yet. Her husband works off and on, sometimes as a woodcutter (it snows here in the winter and people heat their homes with wood stoves) and sometimes working metal. Although she's never been to school, she attended literacy classes last year taught by Habiba, the project assistant. If she sells her piece, she may buy something for her home. This piece measures about 5'1" x 8'4" and costs $275.